This is my first new standard puzzle since Bicentennial Baloons and The House of the Seven Gables (scroll way back to April 10th 2009). The picture is by Salnave Philippe Auguste. He uses his last two names to sign his work but if you google him, use his first name to separate him from a medieval French king named Philippe Auguste. As you can see Philippe Auguste was influenced by Henri Roussseau as was Millevoix ( Jungle Scene, post dated November 9th, 2009 ). 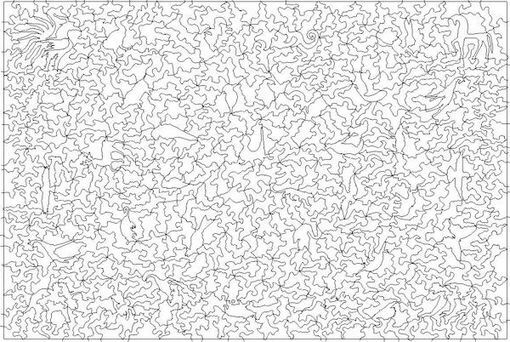 Lion with Gray Hair is the first puzzle that I have designed completely from scratch in a very long time. I hope my designs have improved over the years but I am not so sure about that. All the figure pieces are animals, some extinct. I have tried to make the pieces a little smaller than in past designs. 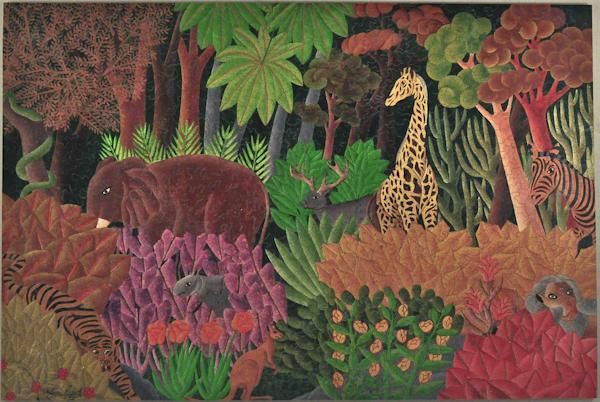 I am working on another puzzle, designed from scratch, with a picture by a Haitian artist but one who, it would appear, was influenced by Vincent van Gogh rather than Henri Rousseau.